I’m typing this on my phone from my sons’ soccer practice. What? I’m paying attention. I took the picture, didn’t I? Anyway, it’s just a practice, so I can multitask. It’s not like it’s a game. Shut up. I’m paying attention. Sort of. 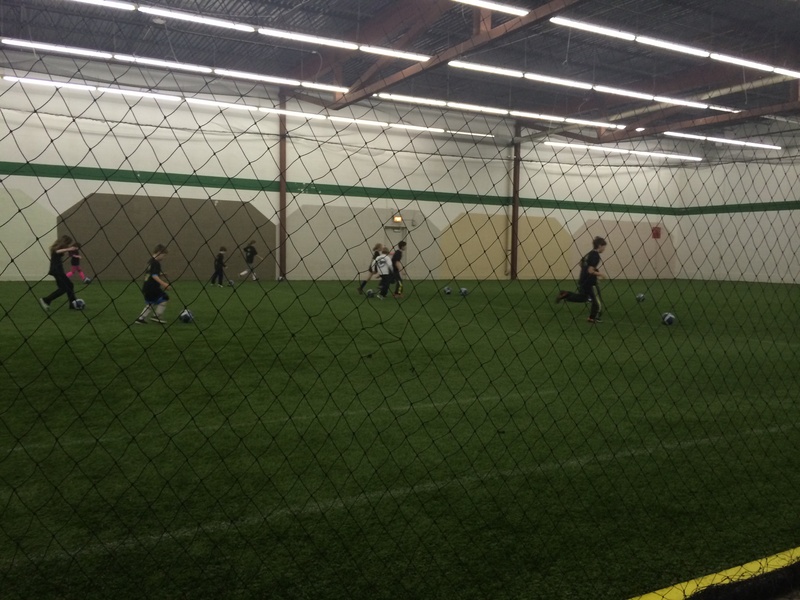 So the place my kids go to play soccer is indoors, because it’s freaking cold outside. I guess that means less space in the indoor place. Or there’s less time because the regular outdoor players have moved indoors. Or something. Because the group my boys are in consists of 6-10 year olds. I signed them up for different classes: ages 6-7 and 8-10. But the powers that be combined them. So there are first graders on the field with fifth graders. Some parents are complaining, like “Those little kids are gonna get clobbered!” Maybe they’re right, but I haven’t seen it yet. What I have seen is pretty amazing: the big kids are at least watching out for the little ones, and in several cases, they are helping the half-pints. Running with them when they get behind in drills. Encouraging them. Sometimes, that’s all the little ones need. I suspect the result of this big kid attention will be faster learning and greater success over time. It’s funny that I saw this tonight, because earlier today, Dan, my author friend in Florida, was encouraging me to connect with other authors in my area. He’d send me a link to a Facebook page or profile. “She lives near you!” he’d say. This is one of many ways he’s helped me prepare for my books’ (yes, plural) release dates. You should join this group. They’re friendly and give great advice. This lady does great cover designs. Talk to her. This one will do an author interview with you. Let me tell you how important reviews are. How does he know all this? He’s done it before. Several times. He’s published thirteen books, four of which have climbed to #1 on various best seller lists. And he’s using his experience to help me. He could be content to let me do my thing and stay out of the way. Like the half-pint kid running down the soccer field, I wouldn’t know any different. Instead, he’s mentoring me. He’s showing me what it takes to succeed instead of waiting to see if I figure it out on my own. What will be the result? Time will tell, but I’m definitely diving into this book marketing thing with a lot more confidence than I otherwise would have. So if you’re a “big kid” and find yourself in a position to help a half pint like me, know that your mentoring will likely not go unappreciated. I hope I can do the same for a newbie someday. I met somebody in a work situation once where they kind of let the rookies struggle, like an initiation, or a mild fraternity hazing. When I asked why, the answers varied, but it came down to: That’s how it was for me. That’s the kind of place where I’d want to work. The culture changed. It became a top producing branch. A few years later I received the Award of Excellence, the top award a manager at that company could receive. Not long ago, I was a struggling new author in the vast wilderness of the interwebs. I was lost and alone, and making lots of mistakes, but there were people – and I had to work hard to find them – but there were people who helped me, and who still do. They saw something special in me, and I don’t want to disappoint them. I know that when somebody believes in me, I’ll run through a wall for them. I’ve found that other people feel that way, too. People say that being a writer is a lonely business. My friend Allison is an amazing talent whose books I’ve been fortunate enough to read, pre-publication. 2015 is getting ready to be a very exciting year for her, and in some small way, I got to play a part in that. I helped. That’s pretty cool. Each of us feels like we are getting the better end of this deal. That’s very cool. That’s the kind of place where I want to write. How about you? Thanks, Dan. I’m looking forward to an exciting year. 🙂 And I’ll help you work through your dialogue tag addiction.